One particular song that hit our playlist tonight was Billy Joel’s Summer, Highland Falls. The lyrics of this song are so moving and beautiful that when I was studying poetry in college, I wrote Billy Joel a letter thanking him for the way he was able to evoke such emotion by pairing beautiful imagery with haunting melodies. it’s either sadness or euphoria. I suppose it’s no wonder that I started thinking about lyrics considering that tonight’s playlist moved us from Billy Joel’s poetic genius immediately into One Direction’s Best Song Ever. The refrain to that song? To say that One Direction is no poetic genius is putting it mildly. To be fair, I must admit that I sang the “oh, oh, oh” and “yeah, yeah, yeah” with just as much gusto as I did Summer, Highland Falls – and with significantly more dancing. By the time we got to What Does the Fox Say, I had hopped down from my mental soapbox and forgotten all about my concern for modern song lyrics. It could be that I was just too busy trying to make my kids laugh by imitating the CGI fox dance moves at the end of the song without sacrificing my driving. I listened to these classic actors, with their rich voices, reciting such banal…well…crap… and I didn’t know whether to laugh or cry. Hearing One Direction (and Miley, and that idiotic Chinese Food song) in that context brought the point slamming home again. The songs whose lyrics are recited in that video (along with a thousand other modern pop and rock songs) make me want to laugh, dance, sing along, and bop my head. But while that makes those songs entertainment, I don’t know that it makes them music in the idealist sense. Truly good music has been a soundtrack of my life. From the heart swell that begins with the opening bars to “Over the Rainbow” to the short story revealed in Rush’s “Tom Sawyer” to the mind bending insanity of “Bohemian Rhapsody” to the tears that well up each time I hear the “Ave Maria” – in its purest and most ideal form, music evokes emotion. I’m also going to try to be a little more deliberate about including some truly great music in the car’s playlist. It’s really easy to focus on all the negative and bad things going on in the world and our own lives, too. And, let’s face it, there really are a lot of crappy, upsetting, unfortunate, and sad things going on around the world. It’s easy to rue the world and our society. It’s easy to become bummed out. But, as much as Facebook drives me crazy at times, I have to admit that I’m thankful that I have a lot of uplifting and joy-filled people in my life who make it their business to keep the good in the forefront. Click one of the words above and you’ll be taken to one of my favorite stories and articles of the past few days. Don’t forget to keep a tissue nearby – I promise you’ll need it! Hope this brightens your day as much as it did mine. I’ve spent the last nearly four weeks husband-less. Though this occurred by choice, it was a choice made out of necessity. I know a month is a drop in the bucket for military families (God bless you all!) and an even smaller drop for those who have lost their spouses (God bless you even more). But, it’s been a tough month for us. I could go on and on and on about how much I’ve missed my husband and how important it is to appreciate and recognize all he does for me on a daily basis; how we, as wives, need to treasure our other half and realize that, yes, without him, you really are incomplete and don’t function as well. Those things are very true, but the hardest part about my husband being gone has not been because I miss him (though I have, terribly), but because I miss him being with our children. I miss my other half, but I really miss the other half of our parenting team. 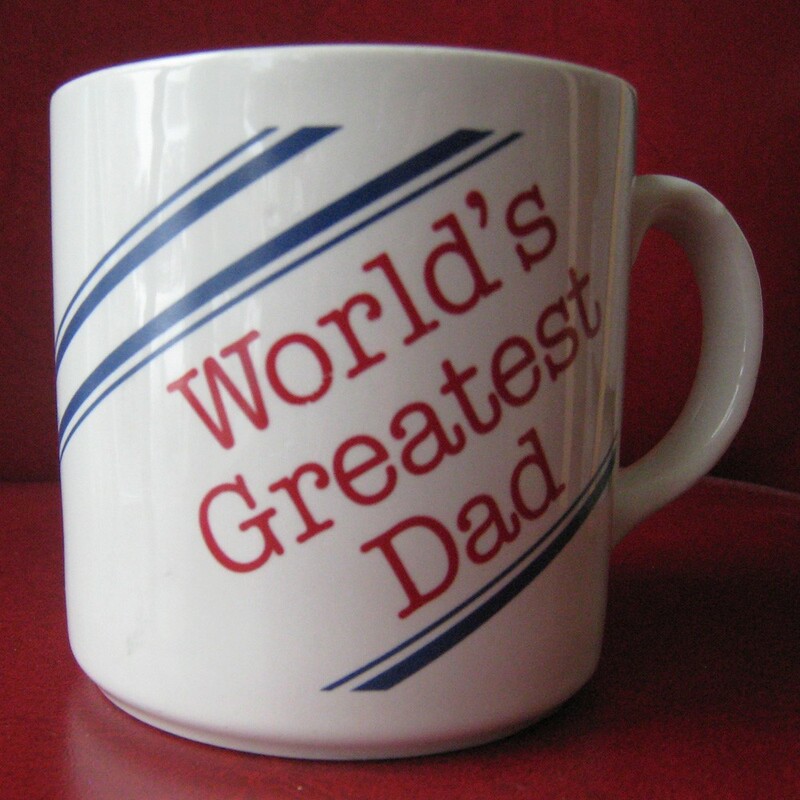 So, with Father’s Day on the horizon, I thought I’d take a minute to mention some of the things that Dad brings to the household – things that I’ve always known, but that have become glaringly obvious while the father of my children has been away. I’m interested in American politics – duh, as most of us are. I’m not super interested, but I do care, and I pay attention out of the corner of my eye. I regularly vote, and I try to read up on issues and make sound decisions backed up by the (hopefully) well formed conscience that has grown through my Catholic education and my ongoing prayer life and learning. I’ve been enjoying, in a matter of speaking, the debate funness going on. The Vice Presidential debate, in particular, caught my attention. I wasn’t overly excited to watch it, I didn’t catch the entire thing – about 2/3rds of it, but I thought it sort of gave us a snapshot of a typical political discussion in ‘Merica these days. There is a reason barbers and restaurant servers try not to talk about religion or politics – you very well may upset someone, and you want a good tip from your customer. That’s our state – we’re afraid to talk about what we think are incredibly important things, because we may offend someone or we may get caught having to defend our position with facts we’re not all entirely sure of. And too often these facts are from various news channels that all seem to have different agendas and don’t usually represent issues (especially religious issues) with any thoroughness or real accuracy. So I think this debate was all too typical, but not necessarily at debates, more like at bars and coffee shops and gatherings of friends and family. I think no matter what political party you affiliate yourself with, you have to admit that VP Joe Biden was less than polite. He interrupted regularly (82 times, according to a count by Republicans- I didn’t see another count anywhere), he laughed dismissively when Ryan was speaking, and he generally gave the impression that Paul Ryan had no idea what he was talking about. 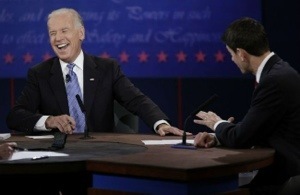 During a discussion about nuclear weapons in Iran, Biden thought it appropriate to laugh. My point isn’t to pick on Joe Biden, it is more to point out the dismissive, “I’m right and you’re a fool if you really believe what you’re saying” sort of attitude. I have no doubt that Biden was presenting what he would like us to believe are facts. The problem is that I honestly don’t remember the words the candidates said during the debate this many days later. I watched the entire first Presidential debate and paid a great deal of attention to it, and I can only remember a little of what was said – instead, I remember the overall emotions and reactions I had to what they said. In watching parts of the subsequent debates, generally the same thing – snapshots, and in my muddled brain basic perceptions I left watching the debate holding of each candidate. My point is that Mr. Vice President Joe Biden did not make a positive impression on me with the attitude he took. Candidate Paul Ryan was clearly nervous, was definitely a man thrown into an unfamiliar situation, but he also came in armed with information that he claims can be backed up by fact and by various studies – information that he hopes we take at face value. He took deep breaths, he drank lots of water, and he came across as thoughtful. He seemed to want to be accurate in his responses, and he kept his emotions in check throughout, even though it was obvious from the get go that maintaining his calm was going to be difficult and crucial through the interruptions and laughing and dismissive behavior. He tried to display a respect for when Biden was speaking, though he clearly disagreed. How often, when we’re in a political or religious discussion do we become the Biden? How often do we dismissively shake our head, and laugh derisively at the person we are disagreeing with? Are we authentically listening to the ongoing discussion, or are we too busy preparing our response? Do we get angry, interrupt, get louder and more vehement in our reactions? I am 100% positive that I have had the exact same demeanor as our Vice President in arguments with people over politics or theology, and probably lots dumber things – and now I see that I totally failed as a Christian in these situations. I’m not convinced that either Joe Biden or Paul Ryan really listened and thought through what the other was saying – and maybe that isn’t really what can ever happen at a debate at this level. Rather, while their “opponent” was speaking, it is almost sure that each was preparing his own response. 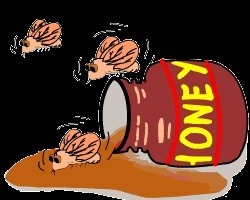 My grandmother used to have a saying: “You catch more flies with honey than you do with vinegar.” The arguing, the getting louder, the repetition, the disrespect for the person we are talking with will not truly change any minds or hearts. We are definitely called to be discussing serious issues in our world today – be they religious or political. 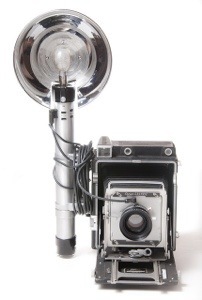 It is not something to just shy away from. But we are not called to win arguments. Because honestly, who ever really wins an argument? Rather, lets enter into real discussions about these serious issues that are close to our hearts. Lets have information that we have researched for ourselves instead of relying on tidbits from Fox News or CNN. Above even the information and the party lines, let us approach political and religious discussions with love and respect for who we are talking with. Because that person you are talking with has Christ within them. And respecting and loving that Christ is far more important than winning any argument. Post note: this is not an attempt to direct your voting decisions, or even a way to approach these crucial decisions. For more on that, see the write up by my much smarter blog-mate, Kristin.